Trump is not actually planning to pay for his wall with a 20 percent tax on Mexican imports. 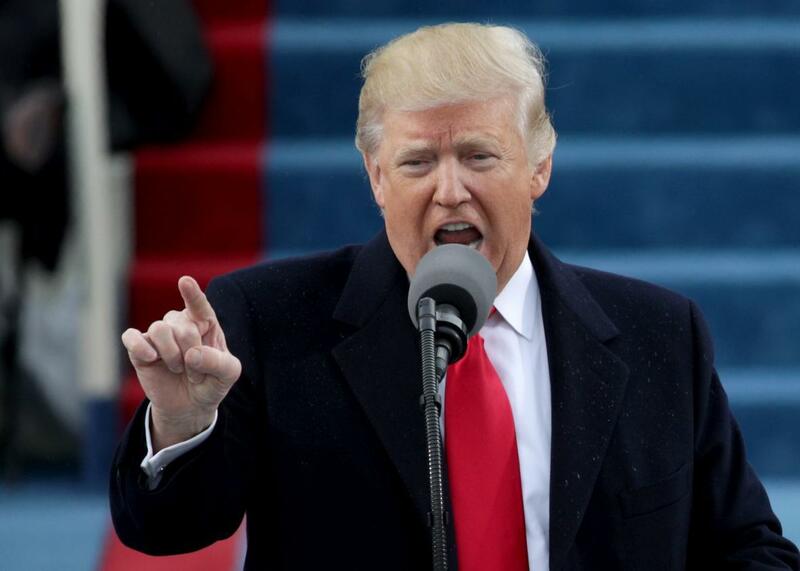 White House Press Secretary Sean Spicer told a group of reporters on Wednesday that President Donald Trump would pay for his proposed Mexico border wall with a 20 percent tax on imports from countries like Mexico. None of this is quite right. At least, I am 99.5 percent sure it isn’t. 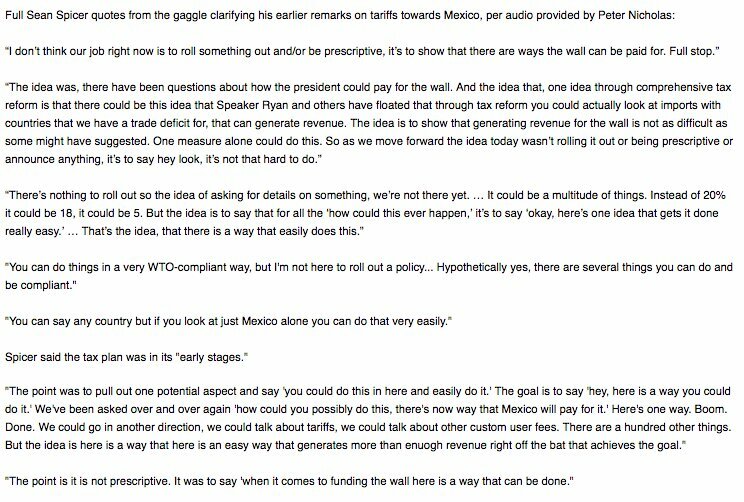 Looking at Spicer’s full comments in context, it appears he was misleadingly and inarticulately describing a controversial change to the corporate tax code that congressional Republicans like Paul Ryan have proposed as a less economically ruinous alternative to a border tax. This is actually big news unto itself. It has been unclear whether Trump supported the GOP’s idea, known as the destination-based cash flow tax, or DBCFT. But it’s not the same as saying the administration plans to pay for the Great Wall of Trump with a tariff on Mexican avocados. The DBCFT, which the GOP wants to set at 20 percent, is a sort of strange, chimerical concept1 that would essentially end the old corporate income tax as we know it. But the most important thing to understand is that it would be border-adjusted. That means companies would not pay any tax on profits from exports. However, they also wouldn’t be allowed to deduct the cost of imports for tax purposes. So how do I know Spicer was talking about an obscure change to corporate taxation rather than a big, fat tariff? When you look at the plan that’s taking shape now, using comprehensive tax reform as a means to tax imports from countries that we have a trade deficit from, like Mexico—if you tax tax that $50 billion at 20 percent of imports—which is by the way a practice that 160 other countries do—right now our country’s is to tax exports and let imports flow freely in, which is ridiculous. By doing it that we can do $10 billion a year and easily pay for the wall just through that mechanism alone. That’s really going to provide the funding. Obviously, 160 other countries do not have 20 percent tariffs on imports from countries with which they have a bilateral trade deficit. What they do have are value-added taxes, or VATs, which are border-adjusted. That’s because a VAT is meant to be a tax on domestic consumption—it’s basically a sales tax that’s collected at each stage of production, rather than just at the retail level—and it wouldn’t make any sense to slap it on exports, since that would just make a country’s wares uncompetitive in overseas markets. Under World Trade Organization rules, countries are allowed to border-adjust VATs. For reasons that are kind of complicated and occassionally debated, they’re not allowed to border-adjust “direct” taxes like the corporate income tax. This has long chafed Republicans, because the United States relies heavily on the corporate income tax and does not have a VAT. They believe (wrongly, in my opinion) that this puts our goods at a significant competitive disadvantage. The DBCFT is basically their attempt to skirt around those rules, which may or may not pass muster. Of course, if the dollar doesn’t adjust as economists expect, that’s a whole other story. Then, the thing starts looking a lot more like a regular tariff, which is why retailers and other heavy importers are basically terrified of this thing and are going to fight it to the death. But that’s all technical economic stuff. And economics don’t really matter for Trump’s purposes. The important thing is that the DBCFT at least looks on the surface like a big border tax, and if Republicans are willing to divert a little money from it to pay for Trump’s wall, he could claim that, in some attenuated way, Mexico was paying for it. Previously, Trump had opposed the idea of border adjustments. But the allure of a theoretical faux tariff that might not raise prices on consumers seems to have won him over. Or, maybe not. After Spicer’s initial comments, the press secretary clarified that, really, he was just spitballing. We’ve been asked over and over again ‘how could you possibly do this, there’s no way Mexico will pay for it.’ Here’s one way. Boom. Done. We could go in another direction, we could talk about tariffs, we could talk about other custom user feeds. There are a hundred other things. But the idea is here is an easy way that generates more than enough revenue right off the bat that achieves the goal. We’ll see what idea Trump lands on next month. Or the month after. Who the hell even knows anymore. 1Mentally, I’ve started referring to it as the ManBearPig tax, because DBCFT is an awful acronym, and “ManBearPig” is funnier than “chimera.” Gotta do what I can to keep tax policy entertaining. 2 How on Earth does that work? If a country slaps a universal tariff on imports, it should buy less from abroad. That should cause the dollar’s value to rise, making imports a little cheaper again, and partially (though not entirely) cancel out the tariff’s effect. Likewise, if a country subsidizes exports, it should sell more stuff to the rest of the world, which will also cause the dollar to rise, partially, though not entirely, canceling out the subsidy’s effect. Combine the two, and the dollar should rise enough to cancel out both the subsidy and the tariff. At least, that’s how the thinking goes.